It’s a huge asset, if you want to become involved with motorcycles, when your family also has a passion for bikes and owns a motorcycle shop on top of it. Ted Sturgess, born in Hamilton in 1920 was the son of Herbert “Pops” Sturgess who had been riding for many years and competing in hillclimbs and on the track, riding Excelsiors and Matchless machines. It was no surprise when Ted began riding at 10 and by age 18, was racing a Royal Enfield at half mile meets. Within two years he won the 3 and 5 mile A.C.U. Championship half mile races and the 100 mile Canadian Road Race held in Oshawa. In the fall, he went on to win the Class “C” Dominion National Hillclimb Championship at Mt Kuhn, Heidelberg. 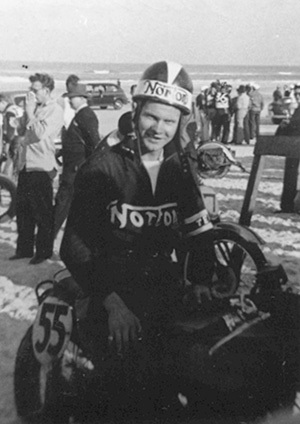 Ted ran at Daytona in 1938 and 1939 with no significant results but came back with a vengeance in 1941 when still as a Novice, he entered the Daytona 100 Mile classic. In spite of a spill on the last lap which cost him the lead, he managed to finish second. However, one of the riders complained to all who would listen, that there had been a terrible rule violation on the part of the AMA when they allowed two different riders to use the same machine. Bill Mathews had run the Norton to a win in the 200 miler the next day. Fortunately, AMA President, E.C. Smith in the “Motorcyclist” wrote that there was no violation and didn’t like to see any fine performance belittled. There were two different classifications of riders, two different events and the certificate of title showed co-ownership of the machine. When Ted returned home, he joined the RCAF and served until the war’s end. Back in civilian life, he took over managing his Dad’s motorcycle business, H. Sturgess & Son at 255 James Street, North in Hamilton but it wasn’t long before he was back in the game. He entered the Daytona 200 in 1947 but was forced out of the race with only 12 laps to go due to chain failure. In 1947 at Picton, Sturgess’ new Manx Norton caused quite a flurry of interest not only in its sleek appearance but by its practice performance, the track and gearing selected was a perfect combination for the Picton track and he easily won the 4 and 8 mile Ontario Championship. He continued with half-mile wins at Oshawa, New Hamburg (fastest lap time for the Walz trophy), Beamsville and Norwich. 1948 was another terrific year and there wasn’t a track in the area that he missed or missed placing – Simcoe, Napanee, Clinton, London, Port Hope, Guelph, Drummondville, Picton, Stratford, Orangeville and the list goes on. At Picton, practice was slow until someone discovered that the racers were burning cleaning fluid instead of 87 octane gasoline. They were flagged into the pits and tanks drained. A red faced oil company admitted a mix up in the drums. Champions from Quebec, BC and Ontario competed at this event and Ted and Bob Sparks battled for lead in the 2 mile which Ted won as well as the 4 mile. At Napanee in the 3 mile expert race, Ted broke a rear axle on the starting line. A call on the PA brought forth a Norton rear wheel from Cornwall dealer. T. A. Irwin. In the 4 mile race, Bob Sparks slid the Velo to earth on the east turn ending a duel with Sturgess who won the race. In 1948, Ted served as President of the C.M.A. Ted was a member of the Hamilton Black Hawk MCC and in 1950 they competed against the Blue Diamond Riders as teams “Flatboard Racing” at Waterloo Arena. This would have been on the wooden roller skating floor and with an extremely short oval, offered plenty of excitement. Ted was high point winner for the Black Hawks team. Ted Jr, also a worthy competitor, carried on the business after his Dad retired and H. Sturgess & Son was sold to James Conrad in 2004 who carries on the business as Sturgess Cycle. One of the outstanding competitors of his time, Ted Sr. had an exceptional riding career for many years and passed away March 15, 1991. In 1996, he was inducted into the Canadian Motorsports Hall of Fame. We look forward to including Ted Sturgess, Sr. as an inductee of the Canadian Motorcycle Hall of Fame. Ted Sturgess, Sr. passed away in 1991.